Dainty, handcut glass adds great depth and reflection to the Japanese chiyogami (old-paper). 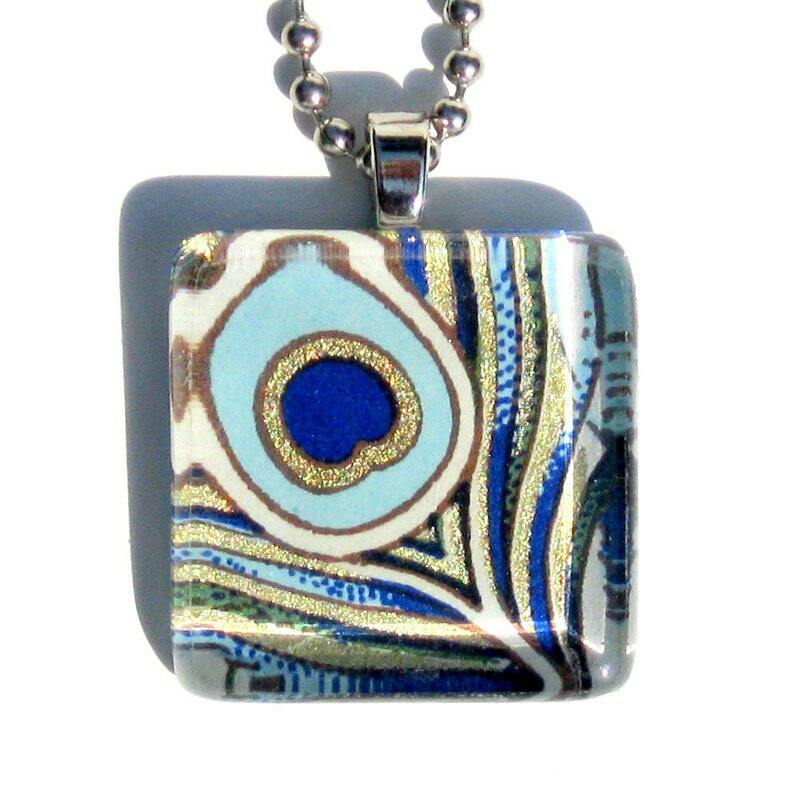 This petite pendant features a gorgeous array of blues and golds in a modern peacock feather design. The glass tile measures 7/8" square x 1/4" thick and comes ready-to-wear dangling on an 18" silver-plated ball chain, feeling light and comfortable around your neck. This necklace arrives beautifully tucked away in a coordinating gift tin. ALSO AVAILABLE IN MY SHOP: 16" AND 18" CABLE CHOKERS and RIBBON NECKLACES! PICK YOUR COLOR AND ADD TO YOUR ORDER TO EASILY CHANGE THE LOOK OF YOUR GAMI PENDANTS & THEY SHIP FOR FREE!! This piece is sealed to be water, oil and stain resistant, but may not be water-proof. Please note....every item is a one-of-a-kind and designs may vary slightly due the pattern of the paper. I lovingly make each piece out of my home and package well to secure a safe journey to yours. Seller stands by her craft and services! Perfect extra gift to give to my bridesmaids!! Thank you so much! They look just like their picture in the shop! Thanks again for putting the buckle back up, it's finally mine after years of wanting it! Thanks so much, I love it! GamiWorks currently processes all payments through Paypal, which also accepts all major credit/debit cards, cash and e-check payments. Although instant payments are preferred to send out orders quickly, you will be contacted about the possibility of canceling your transaction if payments have not been received within 5 days. TEXAS RESIDENCES WILL BE CHARGED 8.25% SALES TAX AT CHECKOUT. I take great pride in the quality of each and every item I send out, but if for any reason, you are not satisfied with your order, please convo me and I will gladly accept your return in it's original condition and packaging, less shipping charges, within 10 days of purchase. Shipping charges already include packaging, handling fees and postal charges. Delivery confirmation is included on all U.S orders, however, confirmation is not available for international shipping orders. GamiWorks is not responsible for lost or damaged items due to shipping. If you want to purchase insurance for your order, please contact me for a quote. SORRY, NO RETURNS ON RESERVED, CUSTOM or BULK ORDERS ACCEPTED. Wholesale and custom orders are always welcome!